America's 'Most Polluted' Lake Finally Comes Clean A one-two punch of municipal waste and industrial dumping gave Onondaga Lake in Syracuse, N.Y., the reputation as one of the most polluted lakes in America. But after years of cleanup efforts, the lake has undergone a transformation, and now the final phase of its cleanup is set to begin. Participants in a fishing derby cast lines from a pier near Onondaga Lake's outflow in Syracuse, N.Y.
Onondaga Lake in Syracuse, N.Y., has often been called the most polluted lake in America. It was hammered by a one-two punch: raw and partially treated sewage from the city and its suburbs, and a century's worth of industrial dumping. But now the final stage in a $1 billion cleanup is about to begin. Standing in his office amid stacks of reports, scientist Steve Effler glances at an old front-page headline of the Syracuse Herald-Journal: "Divers find goo in Onondaga Lake." Goo was just part of the lake's problem. Effler, who created the Upstate Freshwater Institute, knows more about the 4.5-square-mile lake than anyone. But back in the 1950s, before he began studying the lake, he was a kid riding by in the backseat of his parents' car. "The lake [smelled] so bad [from the pollution] that you had to roll the windows up," he recalls. By then, swimming had already been banned for more than a decade. Because of mercury contamination, fishing was banned in 1972, although there were not many fish in the lake. Effler says there was so little oxygen that fish often swam right out of the lake. The lake [smelled] so bad [from the pollution] that you had to roll the windows up. 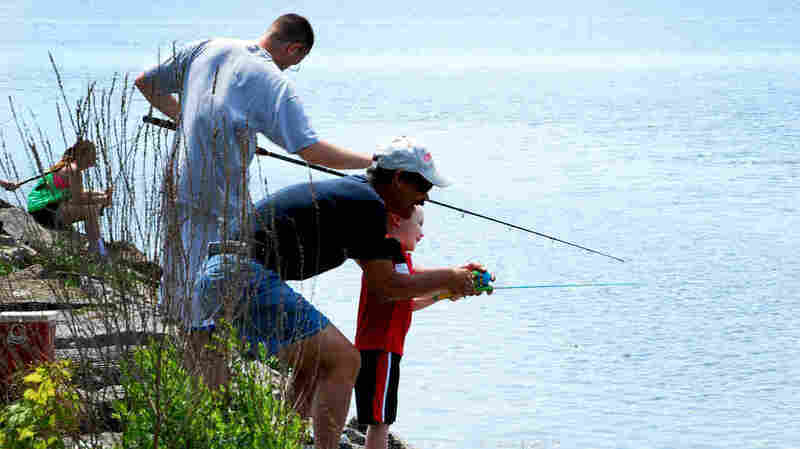 On a recent warm summer day, about 150 people cast fishing lines from Onondaga's shore. They're part of a fishing derby, and many are first-timers here like Tammy Pengaro and her three children. "My kids have caught a lot of bass, perch, sunfish, [and] bluegill," Pengaro says. "I was surprised to see that there's even those different fish here in Onondaga Lake." More than 60 species now swim in Onondaga, compared to about a dozen at the lake's low point. Pollution in the lake was so bad for so long that few people alive even remember when Onodaga had beaches, boathouses and even an amusement park on its shore. The lake's remarkable turnaround is still not fully appreciated by many local residents. It has come after a decades-long fight using federal environmental laws and the courts to force remedial action. Sam Sage of the Atlantic States Legal Foundation says there was no political will to take on a costly cleanup of both raw sewage and toxic waste dumped mostly by the company Allied Chemical. "The municipal [officials] could always say, 'Well, we're not the problem. Allied's the problem.' And Allied could say, 'We're not the problem. The municipality is the problem.' And as far as I'm concerned, they were in cahoots with each other," says Sage, who filed a lawsuit, after which Onondaga County eventually agreed to upgrade its sewage-treatment plant. For the Superfund half of the cleanup job, workers will soon begin suctioning up to 10 feet of toxic mud from parts of the lake, where as much as 20 pounds of mercury were once dumped every day. Honeywell, a successor to Allied Chemical, has already cleaned factory sites and built an underground barrier wall to keep contaminated groundwater from seeping into the lake. Still, the project will leave 85 percent of the lake bottom untouched. Sid Hill, a leader of the Onondaga Nation, calls the cleanup project an expensive Band-Aid. He says the cleanup is not enough for a site that has important historic and cultural significance to his people. "In seven generations, that's still going to be a Superfund site," Hill says. "For that amount of damage that they've done to the lake, it doesn't seem fair to the lake or to the people who use the lake." Ken Lynch, a regional director for the New York State Department of Environmental Conservation, believes more people will start using the lake once it's clean enough for swimming. "That means people can jump in the lake and enjoy the lake. You [can have] contact with the lake without concern of any contaminants impacting human health," Lynch says. Longtime resident Al Dahler says people need to know the lake is changing. "The jokes [in the past] were that if you caught a fish here you'd glow," Dahler says. "Onondaga Lake is an environmental comeback in progress, and gradually we're learning to reconnect to this beautiful jewel." It may have been lost to the community for 100 years, but not too many summers from now people could again be swimming in Onondaga Lake. This story was produced in cooperation with the New York Reporting Project at Utica College.